Despite the great advancements in hearing aid technology, these devices still fall short in certain situations. Even the most advanced hearing aids available still are less effective in situations where there is excessive background noise or the source of sound is far from your ears. ENTAA Care’s hearing instrument centers in Annapolis, Columbia, Glen Burnie, Kent Island, Laurel and Odenton are also home to a wide variety of hearing aid accessories designed to improve hearing in situations where hearing aids fall short on their own. Along with accessories to boost hearing, other accessories are available to make life with hearing aids easier, even for patients who are always on the go. Assistive Listening Devices (ALDs) are accessories that stream sound straight from its source to a receiver near your ear. There are three types of ALDs: FM systems, infrared systems and audio loops. FM and infrared assistive listening devices comprise a microphone and transmitter, placed near the speaker, and a receiver placed near your ear. Audio looping systems are built into certain buildings such as movie theaters and courtrooms. 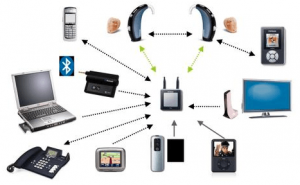 These systems allow patients to connect directly to the audio loop using the “telecoil” setting on digital hearing aids. Microphones are tiny, pen-like devices that can be worn by a speaker. These hearing aid accessories stream the sounds picked up by the microphone directly to your hearing aid. Microphones are a great way to carry on conversations successfully in locations where there is a lot of background noise, like at restaurants or sporting events. Remote Controls allow you to conveniently control the settings on your hearing aids using a small handheld device. Remote accessories fit easily into your pocket or purse, and they can be used to adjust volume, change settings, switch between programs and turn your hearing aids on and off—all while they’re in your ears! Some of the newest styles of hearing aids go even further by connecting directly to your smartphone. These devices can be remotely controlled using an app. Batteries and Chargers are vital to operating your device. It’s important to always have spare batteries on hand in case yours die unexpectedly. Most of our patients use disposable zinc-air batteries in their devices. Recently, rechargeable batteries have gained some momentum as well. No matter what battery type you choose, these are some of the most important hearing aid accessories you will need. Bluetooth® Devices come in many shapes and sizes, but they all perform basically the same function of creating a direct connection from your hearing aids to all the high-tech devices in your life. Using a Bluetooth-enabled device allows you to stream sound from your smartphone, TV, MP3 player, entertainment system, computer and more.